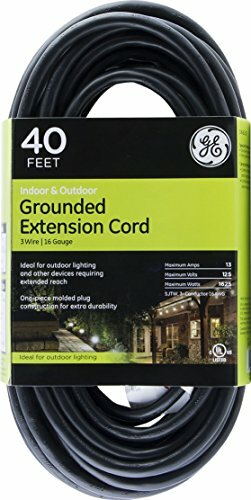 Illuminate your backyard with the GE 40-foot outdoor extension cord. This cord is perfect for outdoor lighting, while also serving other purposes such as landscaping, power tools, appliances, and other outdoor needs. The one-piece molded plug and double insulated cord provide extra durability, making sure your cord withstands the test of time and outdoor conditions. This extension cord has an electrical rating of 13a, 125V, and 1625W and is UL listed.